diagnosed with Glycogen Storage Disease type II, a.k.a Pompe Disease. any manifestation of the disease visible in either parents bloodline. carried out during the 17th week of preganancy. 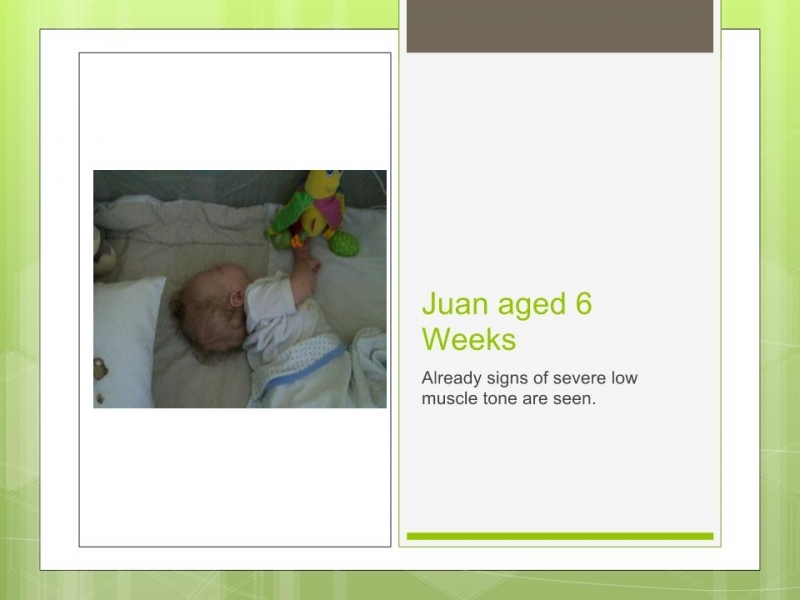 Juan was born on 28 August 2009, relatively healthy, with no immediate cause for concern. At 6 weeks of age, it could be seen that his muscle tone was very low, with him not being able to maintain the weight of head on his own. At 4 months of age, Kelly was particular worried about Juan's failure to thrive and reach his milestones. Juan was tested for many diseases and syndromes to explain his symptoms, including SMA, and Cystic Fibrosis, however, all results where negative. In February of 2010, Juan developed chronic Pneumonia, and spent the next 4 months in and out of hospital. In June, after many months of having a sick child, and being newly pregnant, Kelly went to see Dr Ahmed at the Fourways Life hospital, whom immediately mentioned testing for Pompe Disease due to Juan's obvious hypotonia (severe muscle tone weakness). However, Juan required immediate attention for his repetitive chronic chest infection and double pneumonia. After 2 weeks in hospital, Juan was on the mend, and looked to be improving. Kelly was seeking assistance from Neurologists for Juan's weak neck muscles etc, and the Pompe tests where almost forgotten. Juan was still not able to sit unsupported despite being 11 months old, could not hold his bottle alone, and battled to crawl, only managing to do a one-sided leopard crawl. Juan also choked a lot while feeding, and still was not teaching the appropriate milestones. On Monday, 19 July, 2010, the diagnosis that Juan had Pompe disease came through. "I remember that day like it was yesterday. I was still drinking my morning Tea and checking emails when I received the call. My head spun. I couldn't believe what I had heard." Kelly - Mom to Juan. Immediately, Kelly and Frans, at the advise of her gynaecologist, Dr Baker, received genetic counseling at the Wits Medical Centre's Genetics Department. This was a huge step forward in understanding how the disease has presented and what could be expected going forward with Juan, as well as with the pregnancy. 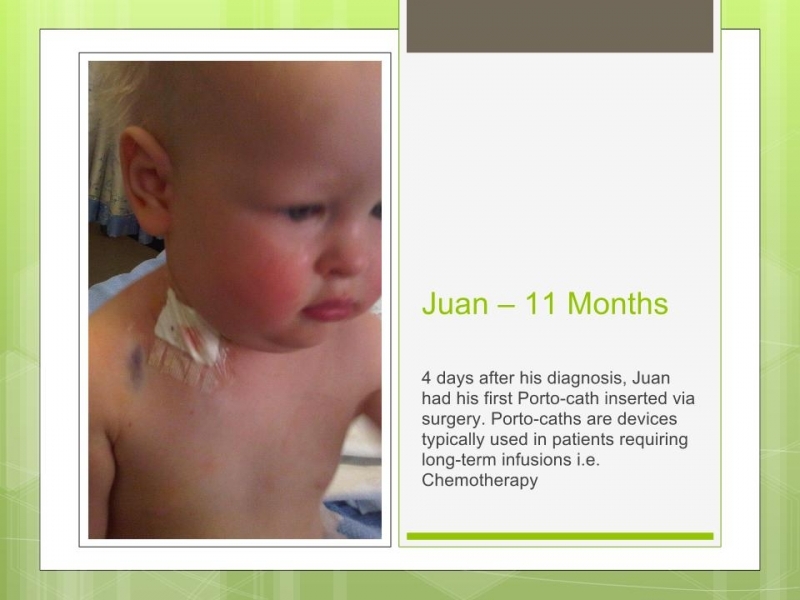 Following this, the following Friday, Juan received his first Porto-cath via surgery. This is a device commonly used in Chemotherapy patients whereby a catheter is inserted into the heart via a main artery, allowing for the easy administration of IV drugs. Juan handled the surgery well, with a huge relief to the family. Juan began Enzyme Replacement Therapy a week later at Dr Rene Heitner. Dr Heitner was a world-class pioneer in the treatment of LSD's, having one of the world's longest surviving ERT (Enzyme Replacement Therapy) patients with Pompe disease in his care. Juan receives Myozyme (ERT for Pompe Disease) on a weekly basis, and has been doing so since July 2010. Myzoyme is a very expensive drug, averaging a cost of R2.5 million per annum for effective treatment and associated costs. Juan also receives weekly therapy, being Physio, Occupational and Speech Therapy was is vital for his in-going treatment. For 20 continuous months, it was a major battle with the medical aids to have all the costs paid for as well as treatment uninterrupted. Pompe Disease is a PMB (Prescribed Minimum Benefit) and is therefore prescribed to receive the minimum level of care that would be received in a state patient with the same condition. However, as Myozyme, was not yet registered in South Africa (this drug was only registered in March 2012), a Section 21 application, prescribing the use of an unregistered drug needed to be completed. This gave the medical aid an out to authorizing the medication immediately, and a long and lengthly battle ensued. Being the only patient on the relative scheme (there is a total of 4 Pompe patients in SA -May 2012) there wasn't any precedence to refer back to in terms of cricital funding decisions that needed to be made, and therefore there was red tape with every requirement. Due to the rarity of the disease, there was also not much relative substantiating documentation and publications regarding the applications and requests that where being made. WIthin the first 12 months, over R120 000.00 worth of medical expenses had not been reimbursed by the medical, not to mention the cost of the increased premiums (the family had to upgrade to the highest tier of the medical scheme) that where now required to be paid monthly. Kelly had also left her full-time job in order to ensure Juan attended all the necessary doctors appointments, therapies and received his weekly infusion which required spending an entire day at the hospital with Juan on a drip. It was here, that the realization that many other families, if faced with the same situation, may not be able to get relative treatment for their child. The dream of Pedalling for Pompe was realized, and the start if this campaign began in 2012. With Juan adjusting well to life on ERT, it was in January of 2012, where the du Plessis family, along with their relative families and friends, began this journey, and Pedalling for Pompe was born. Below is a link to a video showing Juan’s progress on treatment.